As an Israeli-Jewish architect living in one of the most conflicted and disputed geopolitical territories, I have been deliberating on the politics of architecture, global modernism and nationality for many years. This has led me to question my role as an architect in a rapidly urbanizing society. University courses given by Professor Dr. Alona Nitzan-Shiftan pushed my understanding on relations between built environment and it’s social, political, cultural, psychological and economic impacts. This theoretical knowledge was later reinforced by my professional and practical experience as an architect working for 3 years of specialization for licensure on a range of projects in Eastern Europe and Israel. 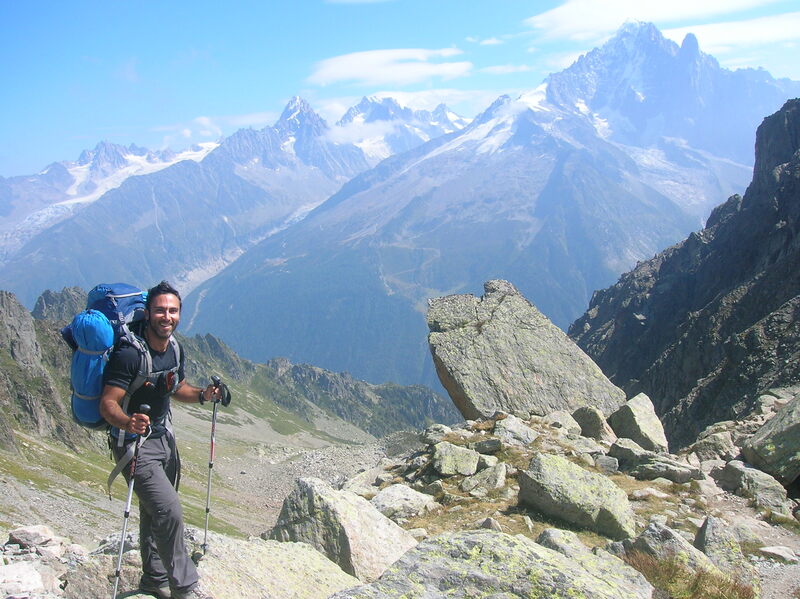 The practice helped me realize the social responsibility architects have towards society. It highlighted that architects can become culture agents and have the ability to take a significant role in pushing forward cultural and social regenerations in society. 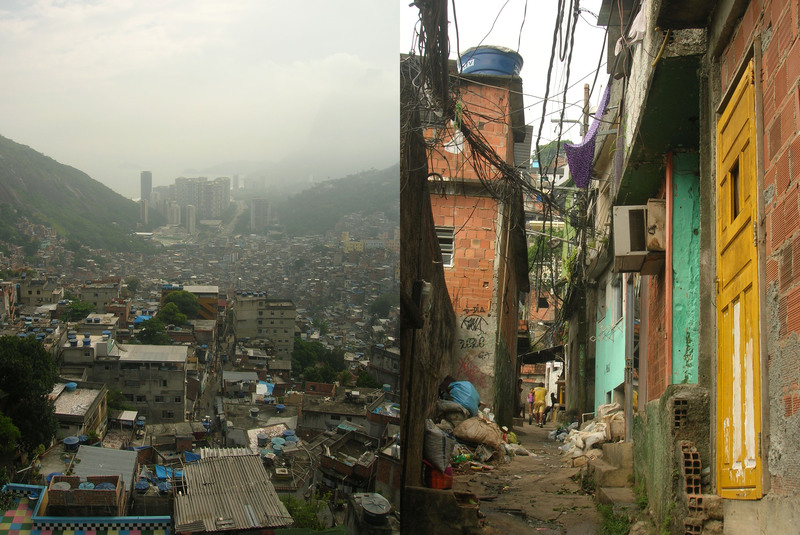 A 9 month journey across South America during 2009-10, brought to light cultural differences, extreme social gaps, and the rapid urbanization shaping the contemporary built environment in Latin cities. 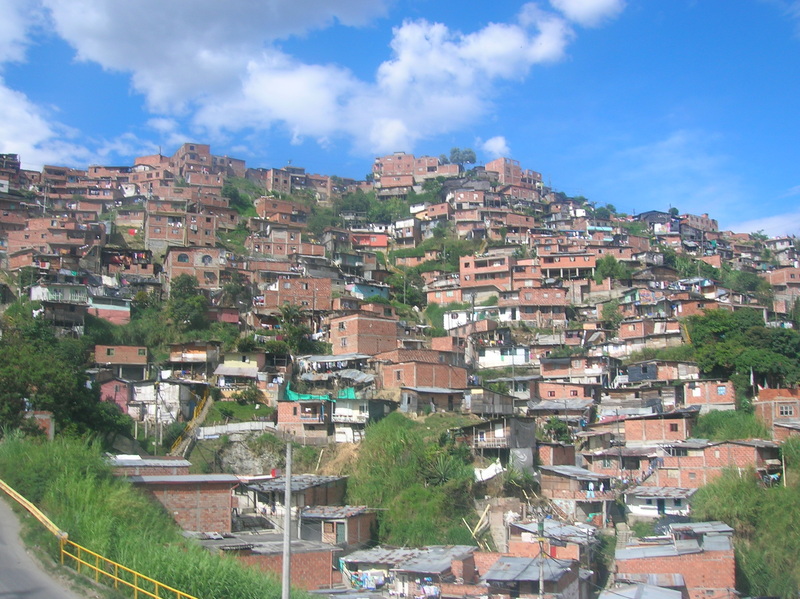 I was specifically drawn into the informal developments, sprawls of the poorest communities in the outskirts of Lima, in El-Alto La-Paz, and on the hills surrounding Medellin and Rio. The development further strengthened my understanding of the larger urban and cultural impact a specific building and urban design can have on its immediate context as well as on a larger scale of the city, environment and its inhabitants. These observations, visits and realizations combined with inner conflicts between my everyday professional practice as an architect and my beliefs concerning the responsibility and role of architecture in society, led me to direct my professional efforts and encountered me with TECHO. TECHO, roof in Spanish, formerly known as “Un Techo Para Chile”, is a Latin American NGO, established in Chile in 1997 by a Jesuit priest aiming principally at an idealistic vision of eliminating poverty from society. During its first years TECHO developed an intervention model to initiate social change and help slum dwellers achieve dignified places to live. Its success soon turned infectious and the organization rapidly spread under the name “Un Techo Para mi Pais” to 19 other Latin and Caribbean countries. In 2012 both organizations were merged and rebranded “TECHO”. At a large scale TECHO’s work is identified with the construction of “media aguas” – a type of transitional prefabricated wood housing which suggest a quick and basic shelter for slum dwellers and disaster victims. Prior to my volunteering in TECHO’s headquarters in Santiago, I had an exceptional opportunity to visit its head office in Peru, and witness in person the construction of these “media aguas”. This is the most important stage where all the efforts of organization concentrate: around the building activity, at the site of transformation for those in need, symbolizing their hope for a better future. 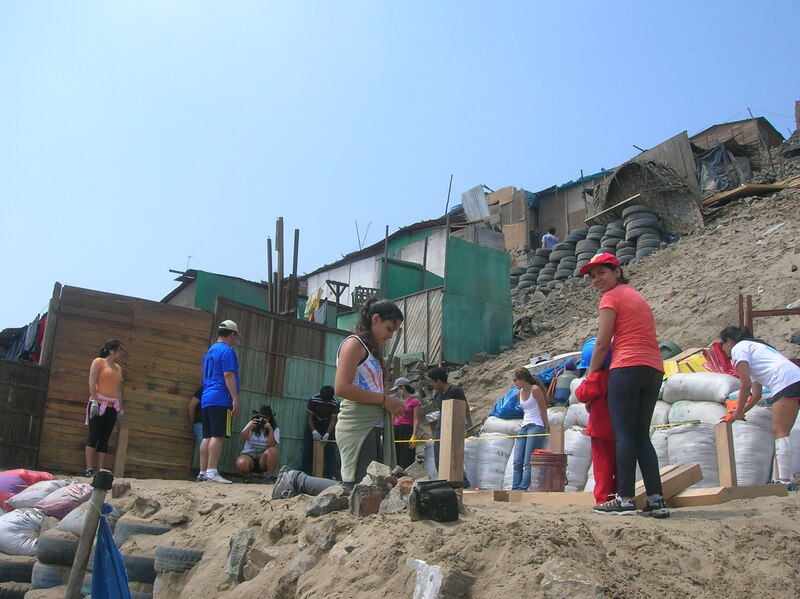 I was invited by the construction director Diego Carhuaricra to accompany one of its “action weekends” with a group of volunteering pupils to the outskirts of Lima at “Ventanilla poblacion”. 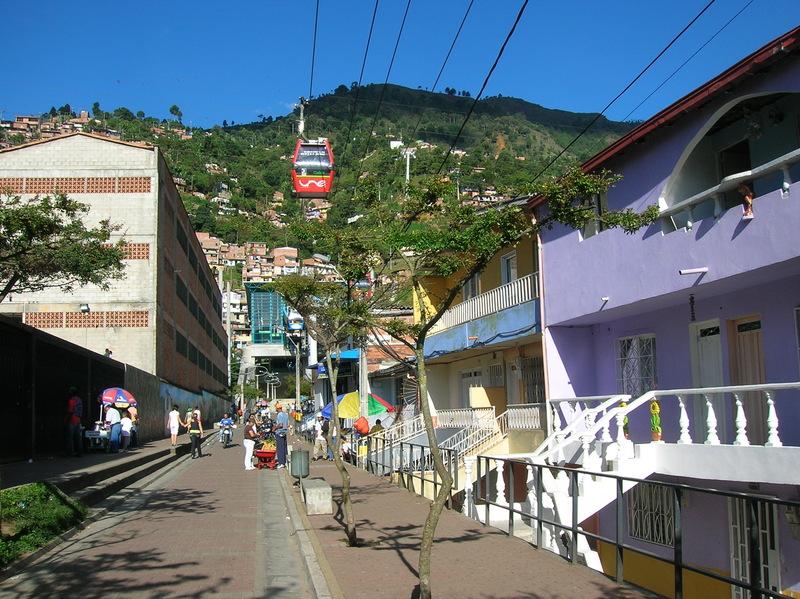 This informal city spread across hills and was surrounded by unpaved roads; challenging mobility and hindering any potential development. 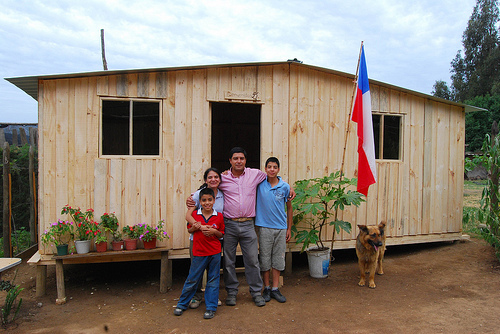 TECHO located 4 weak communities and within them the poorest 40 families that needed assistance. Pupils were divided into groups of 8 led by a TECHO member and after a short acquaintance with families, the group started the construction of a wooden kit house of 3X6 square meters. I believe the atmosphere of solidarity and the sense of mission raised this act into a life changing event for all of us involved, each one in his own way, transmitting a tremendous belief for hope, in the power of society and in humanity. The involvement model of TECHO is compounded of 3 phases: Building transitional housing (media aguas), initiating a social program inclusion in collaboration with local communities and development of permanent housing and sustainable communities. 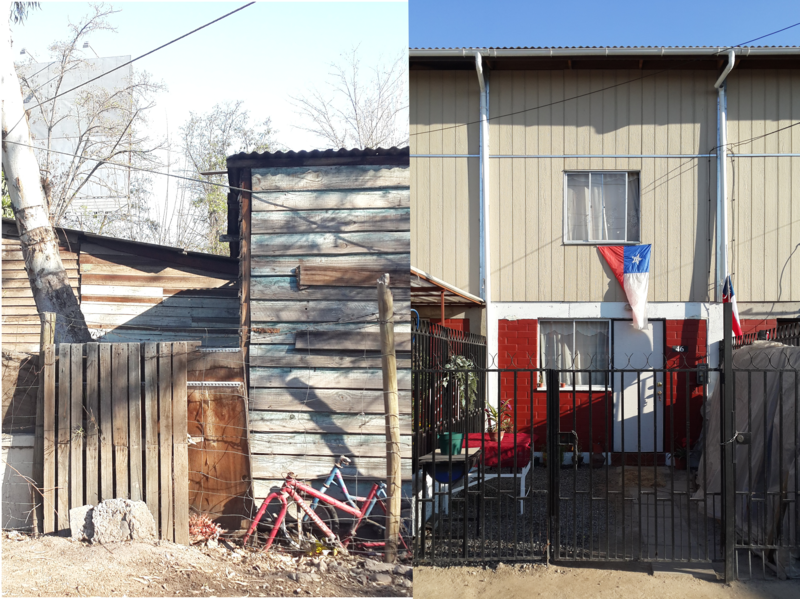 While in most Latin countries the work of TECHO is mainly involved with “media aguas”, in Chile TECHO has developed a wide range of permanent social housing interventions since 2006. TECHO is divided into different departments, 4 of which are closely related with physical projects: Blocks –intervenes in vulnerable social housing of Block types neighborhoods; CIS – center of social investigation; HS – social empowerment; ADH – Area of Housing Development. I participated with -ADH, which is in charge of the social public housing projects and within Metropolitan Santiago region is involved in the 10 most vulnerable municipalities with present and former “campamentos”-slums dwellers. 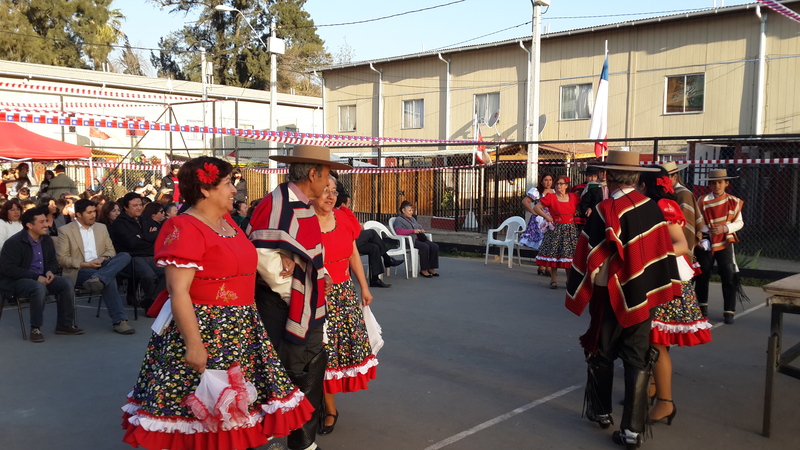 As compared to other Latin countries, poverty in Chile is lower thanks to a massive governmental housing policies from the 80’s, yet there remains a problem of social segregation. TECHO’s interventions in social housing projects relies on governmental housing policy subsides as part of E.G.I.S. – Institutions of Social Housing Management – which is a group of private companies and public NGOs authorized by the government to enact these projects. While most companies’ and NGO’s motivation for collaborating in social housing projects is ultimately financial benefits, TECHO doesn’t gain any financial profits. It only seeks to reinvest 10% of income back into the company; the rest is used mostly for executing its everyday work. 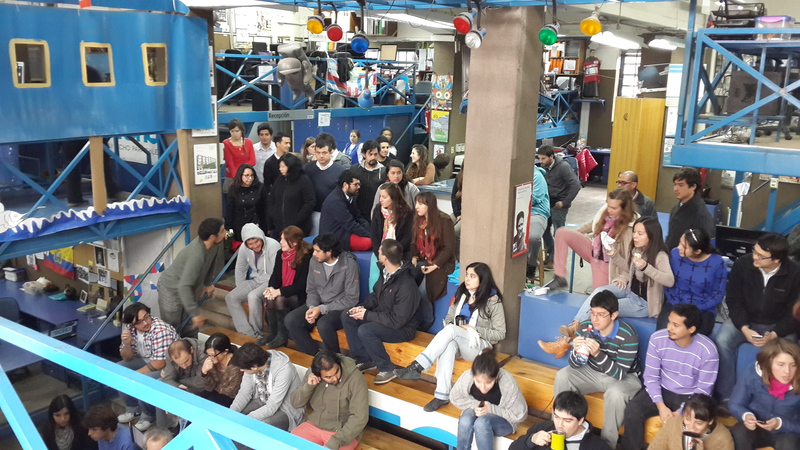 As first steps, the organization establishes close relations with communities through weekly meetings coined “mesas de trabajo”. Each project is directed in a close collaboration of an architect, technical coordinator constructor and a lawyer, together with a social worker. In this unique system of intervention the architecture design approach is supported by the social, legal and technical aspects scaling up the impact the design can have on a project and limiting its unforeseen consequences. Yet there are some issues to be improved and resolved. TECHO encompass more housing units than other E.G.I.S.. While it has a wider participation in social housing projects than other E.G.I.S., many of them have a better quality projects than TECHO. Some of the reasons for this may be the little experience TECHO has in social housing construction, less qualified employees and the lower square meters per unit they offer. Furthermore, while other private organizations are encouraged to quickly construct the projects in order to benefit it financially, TECHO usually deliberates on them for a longer period of time. Another point to consider is that while other E.G.I.S. first purchase a property then elaborate on the project design, this process is reversed in TECHO in some cases resulting in a completed design without a resolution of property purchase. Finally, one of the crucial issues to consider in TECHO is publicity: Most people believe TECHO’s initiative is formalizing slums and “media aguas” and not the building and designing social housing with its social intervention process. TECHO’s strengths are its independent role as a mediator collaborating with municipalities, private companies’ funding, international cooperation, young volunteers and local communities’ enacts. Furthermore its involvement in governmental criticism about social housing, policies and political advocacy of social equality through design, push forward an innovative bottom-up approach to invoke public participation and integration of excluded communities back into society and awareness. Does a project and the public benefit more if architects break out of the “design solving” process and get further involved in the supporting a project financially, economically, socially, politically? Does collaborating with non-design/technical professionals such as economists, social workers, lawyers, business managers, development researchers improve the design process and the quality of the final product? Can we redirect architecture profession towards a wider obligation towards social responsibility and activism with further public collaborations? Can architects be further active advocators and further influence official design and planning regulations to benefit the environment for all communities? Tal is an Israeli architect; he holds a B. Arch from the faculty of Architecture and Town Planning from the Technion Israeli Institute of Technology at Haifa. His interests in primarily lie in the exploration of architecture’s social and political role architecture in conflict territories- primarily centering on the area between Jaffa and Tel-Aviv. In his professional career, Tal has collaborated in distinct architecture firms and projects in Tel-Aviv, Jerusalem and Eastern Europe. 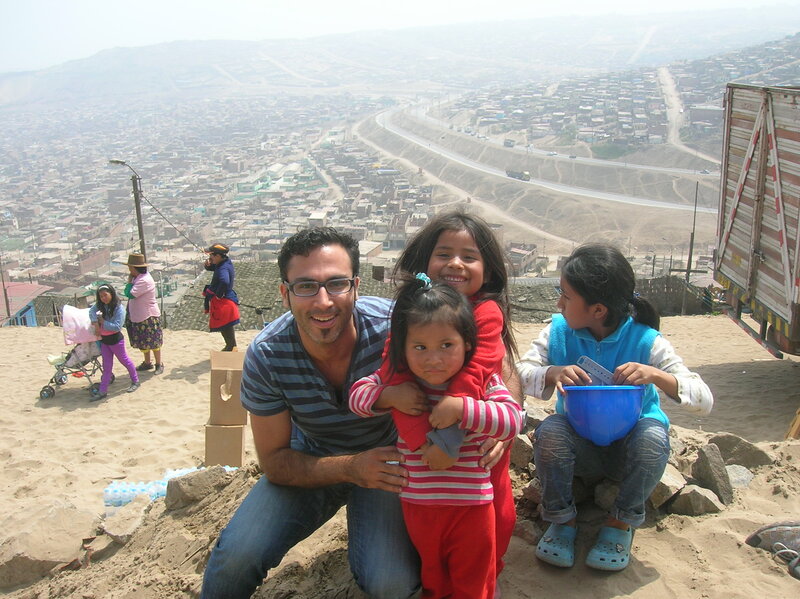 Recently, Tal moved to Chile, where he collaborated with TECHO NGO in a research of community design project aiming to generate social change in a vulnerable district of Santiago de Chile. Tal currently continues his research on the socio-political aspects of design and its potentials to empowering marginalized and vulnerable communities.